The JV was formed in 2013 to invest in stabilised office buildings in major Indian metro cities. 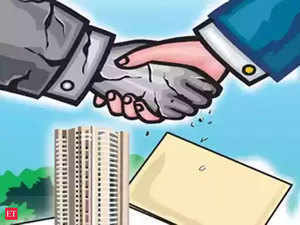 MUMBAI | BANGALORE: In the largest-ever single realty asset transaction in India, Mapletree Investments, a Temasek-owned real estate asset manager, has acquired information technology park SP Infocity in Chennai for around Rs 2,400 crore, said two persons with direct knowledge of the development. SP Infocity was so far jointly owned by the Canada Pension Plan Investment Board (CPPIB) and Shapoorji Pallonji Investment Advisors. “The deal is concluded and is likely to be announced anytime soon,” said one of the persons mentioned above. On October 31, ET had first reported that Mapletree has emerged as the highest bidder for the property and will soon acquire it. Large real estate transactions concluded so far in India such as the DLF-GIC deal worth $1.9 billion and the $1-billion Hiranandani-Brookfield deal involved a portfolio of assets, while this transaction is for a single asset. GIC-K Raheja Corp alliance was the entity that was in in the final lap along with Mapletree Investments. Blackstone Group, Brookfield Asset Management, Xander Group and Ascendas-Singbridge Group had also shown interest in acquiring this asset. 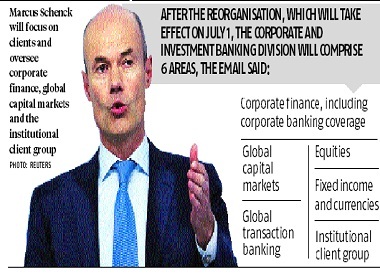 ET’s email queries to Mapletree Investments and Shapoorji Pallonji Investment Advisors remained unanswered till the time of going to press, while CPPIB and transaction advisor JLL India declined to comment on the story. SP Infocity with 2.7 million sq ft leasable space is over 99% occupied with key tenants, including Amazon India, World Bank, HSBC and BNP Paribas. 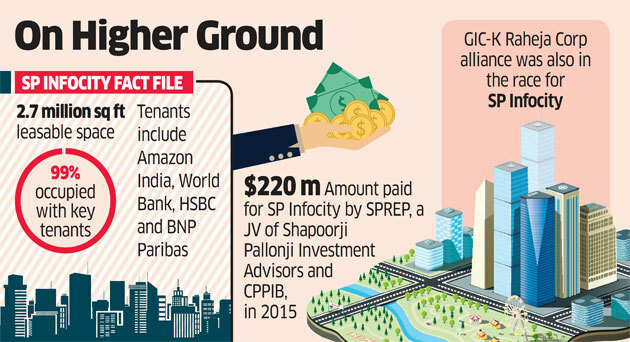 SPREP Pte Ltd., a joint venture of Shapoorji Pallonji Investment Advisors and CPPIB, had acquired this asset for about $220 million in 2015. The JV was formed in 2013 to invest in stabilised office buildings in major Indian metro cities. CPPIB owns 80% with an initial equity commitment of $200 million and is being advised by Shapoorji Pallonji Investment Advisors. 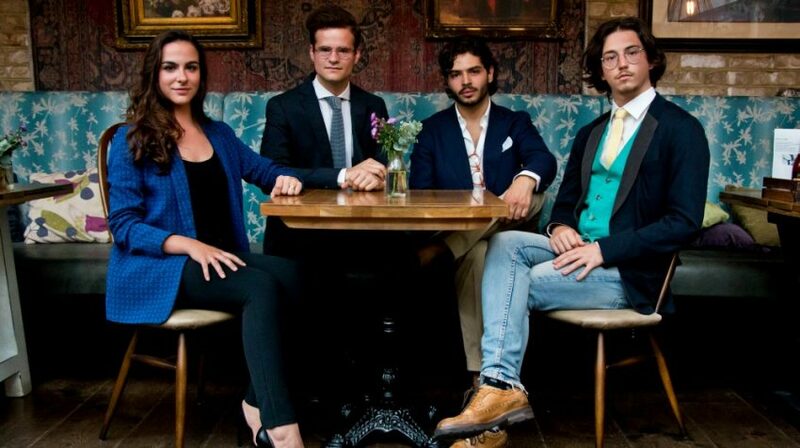 Their model is to own, operate and sell income-producing office properties. Shapoorji Pallonji has also formed a similar partnership with global pension major Allianz Group, which is set to acquire the 2.5 million sq. ft. office asset WaveRock in Hyderabad for about Rs 2,000 crore, edging out other bidders including InterGlobe Enterprises and CPPIB. Mapletree’s first property in India, Global Technology Park, is spread over 13 acres on Sarjapur Outer Ring Road in Bengaluru. When completed, GTP will offer space of almost 1.9 million sq. ft. The first phase of this development, comprising two Grade A office towers, was completed in April 2015, according to the firm’s website. While Mapletree acquired its first property through its Mapletree India China Fund, it could not be ascertained if the SP Infocity transaction is financed through this fund. Mapletree India China Fund had raised $1.2 billion in committed capital in final close in August 2008. Institutional investors, including private equity, sovereign wealth and pension funds, have been increasingly showing interest in picking up income-producing commercial real estate assets in India. Given the ongoing transformation in business environment led by structural reforms, Indian real estate is witnessing a robust rise in investment inflow as foreign and domestic institutional investors pump in more funds into the sector. In addition to this, funds are also eyeing investment and alliance opportunities in the backdrop of the recent policy reforms. While these entities had earlier shown interest in investing in commercial real estate, they are increasing their investment portfolios in the backdrop of the opening up of an avenue for monetisation through real estate investment trusts.